Machine learning is an integral type of artificial intelligence. It allows computers to learn by processing data, recognizing patterns and adjusting its own program actions accordingly. Perhaps the most famous pop culture icon of machine learning is IBM’s Watson who learned to answer questions posed in natural language, and went on to wipe the floor with its lowly human competitors on the game show Jeopardy! Machine learning has long been of interest to industry, but it has only recently started to gain popularity in academic research, in fields other than computer science. In the last few years, it has caught on like wildfire in the social sciences, particularly in economics. The Economist recently called machine learning the “hot new technique” and latest in methodological crazes among economic researchers. HEQCO recently published its first foray into machine learning with its piece on Media Coverage of Higher Education in Canada. Researchers from the University of Toronto Scarborough used both supervised and unsupervised learning algorithms to parse through thousands of Canadian news articles related to postsecondary education. They used methods in natural language processing, much like Watson does, to classify articles into issue topics and identify the tone of media coverage related to these topics. They were also able to analyze the frequency of articles over time and identify significant breakpoints in coverage or shifts in perception and tone. The media paper is only a small window into the possibilities of all that can be achieved with machine learning, which can be a powerful tool in any environment where there is complex big data. It especially outperforms traditional data mining techniques when dealing with non-numeric data. Engaging for a moment in blue sky thinking, this methodology could be applied systematically to the education sector in the following possible ways: to understand student perceptions of the educational system, or to improve and streamline the disbursement mechanisms of financial aid and scholarships, or perhaps to analyze the academic performance and behaviours of at risk-students in schools to better target retention interventions. Of course, the development of machine learning techniques, especially with messy real-world applicability, is still in its early stages. Machines are still far from being able to turn sentient and operate without human guidance. However, our understanding of machine learning is growing at an impressive rate and even its current state has the potential to give us access to big picture insights and trends that would not otherwise be visible to the naked (research) eye. It’s not difficult to understand why machine learning is gaining so much attention. We now live in an age of big and constant data, where any information you could possibly want is probably out there floating on the worldwide web, attached to a funny hashtag. The only limiting factor in making use of this data is the sheer amount of time and energy required to collect, clean, categorize and analyze it — something that would take a human several lifetimes given even a moderately sized dataset. Artificial intelligence offers a solution that combines the human-like functions of pattern recognition and learning with the computing ability to process information quickly and accurately — without complaining about work-life balance. 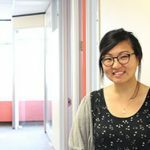 Cassandra Cao is a senior researcher at HEQCO. I want to learn python -was wondering if you offer some course or could direct me to some resources?